He is Doug Hunt and we do share our Hunt line back to Dr. Thomas. Like researchers before him, Edgar Hunt, Jean Hunt, Allen Hunt, Jimmy Hunt, Jr., Doug wants to get the many disjointed pieces to the Hunt 14 progenitors life right. He wants to get it right and get it “out there” for all researchers to access. He and I are working on that and I am as giddy as a school girl just asked to prom by the cutest boy in school. What made you want to do this, go to Richmond for the LVA and Durham for Duke University and do the research? Basically, I’ve been fascinated with the idea that for so many years our family has run into a dead end finding the origins of the 14 beyond a few bits and pieces about Thomas Hunt. At first, I started by looking up various Hunt families (like the famous Westchester, NY one at Hunts Point) to try to find a link, but often there are too many Thomases and too few facts! I also started to compile facts on what was already known, but I kept finding incomplete or inconsistent information…like did he live in Bedford or Franklin? Was he a Doctor? How do we know? Was he in prison, when and where? Why do people keep saying he is “Thomas Elwood Hunt IV” (probably wrong)…I figured the best way to solve the origin question was I had to find everything that it is possible to know about Thomas Hunt and that hopefully that would lead to a link or discovery. Also, doing that would help me sort through the various rumors (which had turned into several disorganized text files at the time).So I started systematically citing all sources, pulling original documents, and transcribing / interpreting the records. It turned out that by doing so I was able to discover more an more leads into other possible research. Not only did I gain a clearer picture on the life story of Thomas and his family in Bedford / Franklin, but also I began to discover the historical context of some of the events too.I have not yet made the significant breakthrough I was hoping for…to find some clues to his origin…but I still have more research to do, and I feel the information I have gathered will help as a reference in the search, not just for me but for all researchers. Your Dad and you went together? Yes we did, back in January. The reason we went was actually the John Hook papers. I had discovered several documents linking the two of them, suggesting a close business or personal relationship. The key findings were (1) in Hook v Hancock 1808 Augusta County, there is mentioned a letter written by Thomas to John Hook (relating to a debt) that was marked “exhibit D”…but when I searched through all the documents (90 pages) there was A, B, C, …. then E, F!!!! It was rather frustrating that the document was missing. I figured it would be really cool to find a letter written by Thomas, but then (2) shortly afterwards I discovered that John Hook and his company had kept a ton of letters and documents (7000+ pages) and they were available at Duke University. I figured there was a high probability of finding a letter to or from Thomas considering their other shared records. 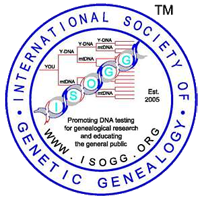 So I booked a flight (cheapest time of year, January) and invited my father to come along (he had actually started all this research a few years ago, discovering we were related to Esli and taking a trip to Mississippi). We also made a plan to visit the LVA since it contained a vast repository of county / state records on microfilm. Unfortunately I didn’t find a letter like i was hoping, but the worst part was I didn’t plan enough time there. My dad and I probably went through 20 or so boxes in an 8 hour period, but I had reserved 46 of them, so we might have missed something. I am hoping to go back someday. We did, however find other things that were unexpected. 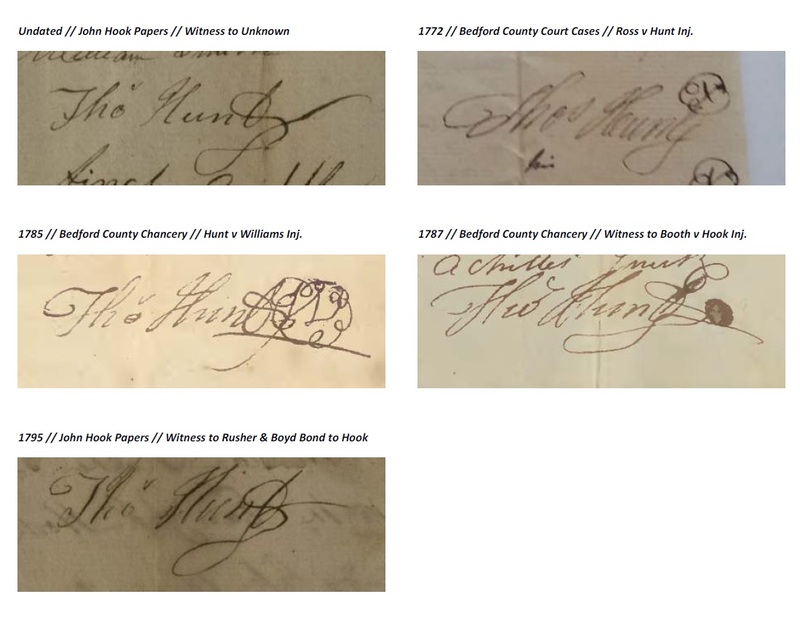 I was able to document the land rolls from John Hook’s estate, which showed his land obtained from Hunt. Also my dad found several signed documents from Benjamin Hunt (as witness), and records from him at the “Hailsford” store. I believe (based on handwriting) that Benjamin was actually a clerk at the store (would make sense considering he was a teenager at the time) and later worked for John Hook…though I wouldn’t say with 100% certainty that it was Benjamin of the 14 (probably but not 100%). We also found that Jesse, Uriah, Joel, Thomas, and Benjamin were all customers of Hook at one point or another, and the sequence of indexes indicated that Thomas, Uriah, Joel and Jesse were earlier customers, probably before 1790, then Thomas and Benjamin 1790 to 1795ish…then later only Stephen Hunt appears. It seems to fit with the ages of the 14 and the suggestion that Stephen did not come to Bedford until later. Who is the family Historian, you or your dad? At first my Dad, but I have taken over more and more as I get older (I’m 32 now). I got my interest from my Grandma from her stories about the family and her as a kid. Also, my Dad has a cousin, Marsha, who basically knows everything about our more recent genealogy. I am an engineer…hence the desire to systematically organize things!